With nearly 400 different dishes on the collective Spokane Restaurant Week menu, it would take larger stomach (and budget) than we’ve got to try every dish. But here are a few gluten-free options that caught our eye, and we’ve got more lists here and an expanded list for vegetarians. Jalapeno glazed salmon at Saranac Public House. Jalapeno glazed salmon at Saranac Public House. Photo by Young Kwak. First of all, hat tip to Gluten Free Spokane for giving a thorough look over the whole menu. They’ve even tracked down which restaurants have unlabeled gluten-free options and which sauces to ask your server about. Menu says: Chickpea fries, sundried pepper and olive relish, arugula pesto. We say: Chef Branden Moreau is featuring this dish for Spokane Restaurant Week, and he knows what he’s doing when it comes to gluten-free. Menu says: Wild Alaskan Sockeye salmon baked with a crab and shrimp meat mix, served with couscous and sauteed vegetables. We say: Who would even want gluten when you can get so much without it? The appetizer and soup/salad courses also have gluten-free options. 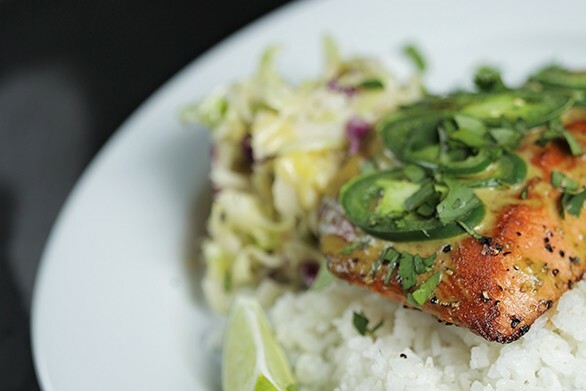 Menu says: Wild caught Alaskan sockeye salmon, pan-seared and oven-finished with a brown sugar, cumin, jalapeno and lime glaze. With coconut rice, fresh lime and sweet mustard coleslaw. We say: We couldn't resist another excuse to publish that delicious-looking photo up top. Menu says: Chef's cut ribeye dusted in blackening seasoning broiled hot. Served with gorgonzola cream sauce, white cheddar mashed potatoes and seasonal vegetables. We say: People who still think “gluten-free” is kind of like “vegan” or “juice cleanse” can just stop, right now. Heading out to First Friday? Here's a map!